Every few years a film comes whose look redefines and influences future films. "Tron" in 1982 was one such film that influenced an array of films including "Matrix". 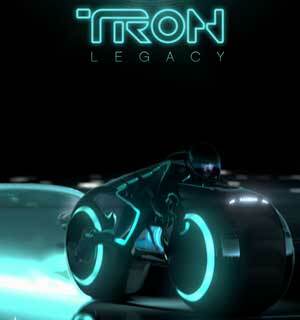 "Tron: Legacy", despite its flaws, may end up being one such film. In the film, Sam Flynn's (Garrett Hedlund) father disappeared 20 years ago. When a page comes from his now defunct office, Sam goes to investigate. Just like in the first film, he is scanned, digitized and sucked into the world of computer grid. He finally meets his father Kevin (Jeff Bridges) who's imprisoned and fights to rescue him, Quorra (Olivia Wilde) and the rest of the world, from his father's alter ego Clu (Jeff Bridges). There are quite a few things that are not right with the film. Not enough explanation is given to many things forcing you not only to suspend disbelief, but to 'absolutely' suspend it. Yet, once you manage to do it, "Tron: Legacy" becomes a hugely entertaining fare. Then there are the spectacular special effects. Those who see the film today would laugh at the shoddy work of the original, which was cutting-edge back then and inspired a host of films including "Matrix". The circle is complete when "Tron: Legacy" ends up being heavily inspired by the last two parts of the "Matrix" trilogy. The spectacular visual effects and the scintillating, sleek background score by Daft Punk and sound design by Steve Boeddeker is bound to leave anyone spell-bound. The metaphor of the film is also good. Like "Dr. Jekyll and Mr. Hyde", Kevin and Clu are opposite alter egos. While Kevin is all for inclusion, his digital persona Clu is all for perfecting the system by destroying any anomaly. And Clu raises an army to further his purpose. Real-life examples to illustrate this analogy are aplenty. The Fascist dictators to even democracies like the US, like Clu, believe in purging 'anomalies' with military might. The world has seen its fair share of Clu-like exclusionists. Kevin is the opposite -- a Buddha-like messiah who sees the true miracle of creation, even the creation of anomalous programmes in a computer system. Where the film does not score is the excessive suspension of disbelief that may make it jarring to the average viewer, especially one who has not seen the original. Yet, for the spectacular special effects and background score alone, the film deserves at least one watch.